As I said in my last post, I presented at the October addition of TeachMeet Melbourne. With a Google Summit happening in Melbourne this week, the focus of the meet was Google Apps and Collaboration and lots of first time TeachMeeters attended as a result of being in town for the summit. Below is a collection of tweets from the meet that may inspire you with new insights or encourage you to explore our new learnings further. My twitter tag is noticeably absent from the list – I was too busy as the official timer on the night and possibly got too comfortable on the very oversized beanbag I reclined in for the duration ( the free beer didn’t help either!) Enjoy! 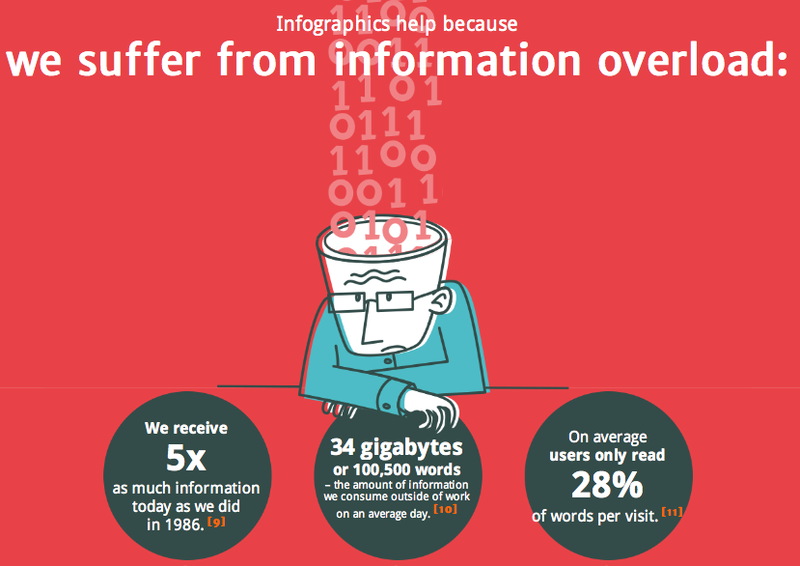 Found this fantastic infographic touting the success of infographics. Reading it ( or more correctly, viewing it) immediately focused my thoughts on the use of visual texts in classrooms today. 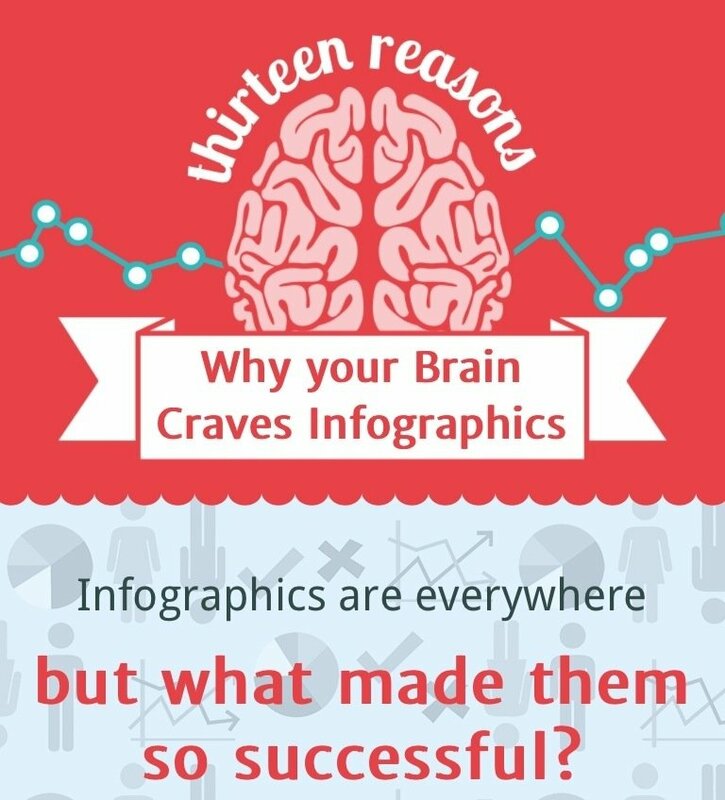 Click on the screenshot above to view the animated, interactive info graphic that presents 13 reasons why we should use infographics ( or visual texts in general). Unlike other infographics I link to on Mr G Online, I’m not going to discuss the specific points presented – that would be contradictory to the message of the infographic. I’ll let you get your own meaning from it. However, I am going to reflect on how it made me consider the use of visual texts in education. 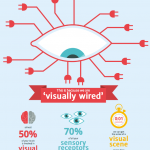 If we take at face value the research this infographic is based on, human beings are, at heart, visual learners. Our first written languages were image based (hieroglyphics). Our first recorded historical artefacts are cave paintings. Before the Bible was printed, the story of Christianity was predominantly told through Church Art. Museums are based on our desire to see artefacts firsthand. I in no way want to devalue the importance of reading. Making connections with the printed word promotes creativity and imagination as we strive to interpret the detailed writings of an author. Words allow us to add our own meaning to written texts rather than have an artist’s or film maker’s interpretation forced upon us. Reading is vital for learning and engaging with the world. Having said that, though, Literacy Education has been dominated by the written word, and to a lesser extent, spoken word in the form schooling has taken over the 100-200 years of formal education as we know it. In recent curriculum documents we have seen viewing make its long awaited debut, but it still seems to be a poor relation compared to the other strands of Literacy. Improvements are being made, but as teachers do we fall back to written and spoken texts because its easier for us? 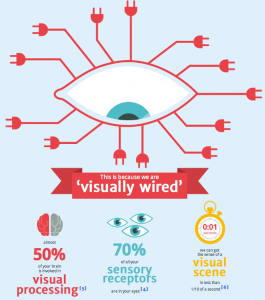 If our brains are visually wired, then it makes sense that we visually present information, instructions, new learning, methods. 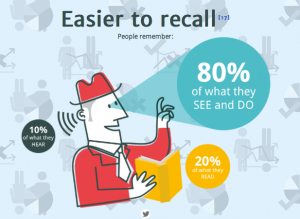 If half our brain capacity is involved in visual processing but we present our lessons verbally or in written text form, how much are we getting through to our students? If 70% of our sensory receptors are in our eyes, then why do we persist in TALKING so much as teachers? How much more learning could take place if we had much less word based instruction (written or oral) and much more Visual instruction, considering we can make sense of a visual scene (0.01 sec) so much more quickly than a spoken or written scene. 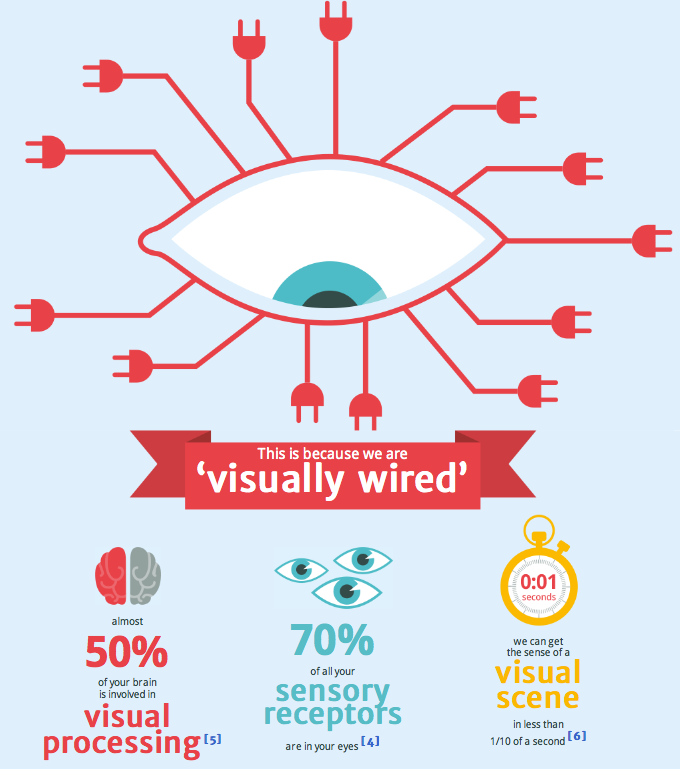 I’m not saying teachers don’t use visuals – I’m saying we need to A LOT more. In Mathematics we take away the visual representations far too early in our quest to rush in the algorithm and written methods. Singapore’s visual pedagogy in Maths Education is an example of how it should be done. Textbooks include plenty of visuals but are still dominated by the written text in putting forward the primary content. The visuals seem to be add ons. It should be the other way around. Start with the visuals as the primary content and support it with accompanying text. How often do we complain that our students don’t follow instructions? Or that they don’t remember anything we taught them? How often are these instructions 10 minute monologues based on fifteen points teachers think are important to get across but in reality have no hope in getting across to overloaded children’s memories? Is ‘teaching’ verbally for 10 minutes resulting in students ‘learning’? Yes it takes more time to create and then present a visual alternative but do we waste even more time repeating lessons or instructions that would have been delivered more effectively with visual elements. In our quest for improved standardised test scores, we cram more literacy lessons based on written texts at the expense of the Visual Arts. We spend countless hours teaching children to comprehend worded Maths problems but ignore how much visual representation of number concepts can improve their problem solving techniques. “Flipping the classroom” has its pros and cons. Like any pedagogy it can be done well and poorly. But if at its heart is the ability to provide relevant, purposeful visual resources that can provide a learner with extra support outside and within the classroom environment, we can’t be doing a bad thing. The world of our students IS overloaded with information. The expectations of our curricula are overloaded with information. How we present that information then is important. If it is primarily written and verbal we may well be banging our and our students’ heads against the proverbial brick wall if, despite the best of intentions, that information is not filtering through the brain’s barriers to processing and retention of information. We owe it to ourselves and our students to dig deeper into the theories and statistics highlighted/implied in this infographic to ensure we are giving everyone the best chance to learn. What do you think? Thanks to Education Week‘s blog for drawing my attention to this work on Creativity. Creativity is defined as one of the four 4Cs of Learning and Innovation in 21st Century learning. This OECD Creativity working paper is an interesting start in working out how we can define, develop and assess this wide ranging ‘skill’ we call Creativity. 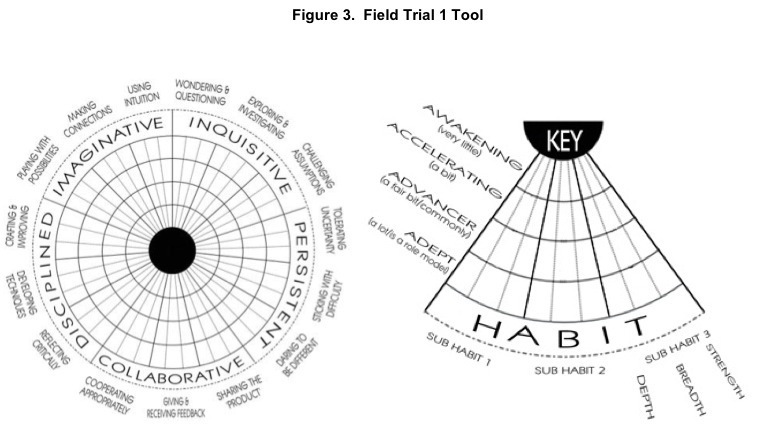 On display in the image above is a protype assessment tool developed from much research as outlined in the working paper. 1. Inquisitive. Clearly creative individuals are good at uncovering and pursing interesting and worthwhile questions in their creative domain. − Wondering and questioning – beyond simply being curious about things, the questioning individual poses concrete questions about things. This enables him, and others, to think things through and develop new ideas. 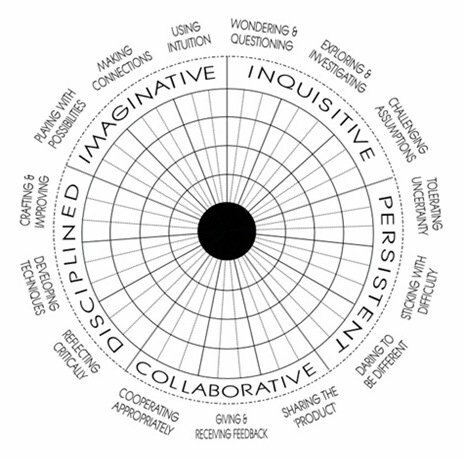 − Exploring and investigating – questioning things alone does not lead to creativity. The creative individual acts out his curiosity through exploration, and the investigating individual follows up on her questions by actively going out, seeking, and finding out more. − Challenging assumptions – a degree of appropriate scepticism is an important trait of the creative individual. This means not taking things at face value without critical examination. 2. Persistent. In line with Thomas Edison’s remark above, this section has been repeatedly emphasized. − Sticking with difficulty – persistence in the form of tenacity is an important habit of mind enabling an individual to get beyond familiar ideas and come up with new ones. − Daring to be different – creativity demands a certain level of self-confidence as a pre- requisite for sensible risk-taking as well as toleration of uncertainty. − Tolerating uncertainty – being able to tolerate uncertainty is important if an individual is going to move ‘off of the starting blocks’ on a project or task where actions or even goals are not fully set out. 3. Imaginative. At the heart of a wide range of analyses of the creative personality is the ability to come up with imaginative solutions and possibilities. − Playing with possibilities – developing an idea involves manipulating it, trying it out, improving it. − Making connections – this process of synthesising brings together a new amalgam of disparate things. − Using intuition – the use of intuition allows individuals to make new connections and arise at thoughts and ideas that would not necessarily materialise given analytical thinking alone. 4. Collaborative. Many current approaches to creativity, such as that of John-Steiner (2006), stress the social and collaborative nature of the creative process. − Sharing the product – this is about the creative output itself impacting beyond its creator. − Giving and receiving feedback – this is the propensity to want to contribute to the ideas of others, and to hear how one’s own ideas might be improved. − Cooperating appropriately – the creative individual co-operates appropriately with others. This means working collaboratively as needed, not necessarily all the time. 5. Disciplined. As a counterbalance to the ‘dreamy’, imaginative side of creativity, there is a need for knowledge and craft in shaping the creative product and in developing expertise. − Developing techniques – skills may be established or novel but the creative individual will practise in order to improve. This is about devoting time to a creative endeavour. 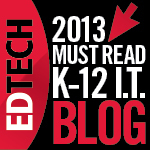 − Reflecting critically – once ideas have been generated, evaluation is important. We could call this ‘converging’. It requires decision-making skills. − Crafting and improving – this relates to a sense of taking pride in one’s work. The individual pays attention to detail, corrects errors, and makes sure the finished article works perfectly, as it should. On first glance, I didn’t get the tool but then I found this part of the paper, which explains the purpose of the segments. Read the paper for more detail. Here is a Scribd version of the paper in full for you to view in its entirety. I’m not commenting on it here until I have read it fully but am interested in your opinions about defining, teaching and assessing Creativity, either your own ideas or a response to this effort from the OECD. This infographic on the Social Times appeared in my Zite feed the other day and it got me thinking about how we are preparing our students to use the Internet. 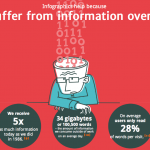 While infographics are never definitive sources of valid information, the statistics provided leave us as teachers and/or parents with much to address. Since I’m firmly in the “The Internet is NOT making our children stupid, it just makes it easier for stupid people to show themselves to the world” camp, I’m going to put my thoughts out there in this post and address some of the points made in this infographic. Let’s make it clear from the outset, the Internet “ain’t goin’ nowhere!” Regardless of continued fears and resistance from politicians, ‘shock jocks’, parents, teachers both young and old, and yes, even some students who haven’t had the exposure we assumed they all get, the Internet is and will continue to be the all pervasive information providing and social networking juggernaut we see every day in our lives. Look no further than the first stats in this infographic. Regardless of the source or the overall accuracy, there is no doubt that a lot of our students do have an identity on the WWW from a very early age (90% by age 2??). My Facebook friends bombard me with countless unsolicited photos of their toddlers, photos that 15 years ago would have resided in a dusty photo album on the coffee table at their home. Sit at any restaurant (or theatre, museum, train, hospital ward, church!) today and you will be surrounded by youngsters (50% by age 5?) blankly tapping away at smartphones and tablets so their parents can get some respite from them. And the teens? Their whole life is online. Nearly all of them (95%?) always communicating (80% on social media?) from anywhere, anytime (49% online from phones?). So that’s the reality we face. We do not live in 1950s Pleasantville anymore. Therefore, keeping a curriculum shaped by leaders who grew up in Pleasantville, focussed on the 3 Rs but not technology is not facing the world we currently live in. Don’t get me wrong, I’ve been teaching the Rs with great rigour for 25 years and continue to do so today. I just do it through technology (AND ‘old school’ methods). Now the big problem for me in all this is this misguided notion of ‘digital natives’ and ‘digital immigrants’. A lot of educators and parents use this as a reason for not ‘interfering’ with their children’s internet use. “They know more than me!” is the typical response….And it’s wrong. Being ‘born’ into a culture does not make you an expert in it. Just because a 2 year old has worked out the touch interface of an iPad doesn’t mean he can select appropriate tools to learn. Just because a 15 year old knows how to search YouTube for how -to guides to learn how to use a popular Web 2.0 tool doesn’t mean she can produce a quality presentation that will educate fellow classmates. Skill ≠ knowledge and understanding. Any teenager can mechanically drive an automatic car within a week of driving lessons. As parents, we still need to teach them to drive safely and responsibly. Our kids aren’t stupid because of the Internet. They are sometime stupid on the Internet because they’re kids. They may have been born digital, but just like the rest of their life outside of the digital, they have much to learn in the digital world. And the rules we as adults understand outside the digital world still apply inside the digital world. So let’s look at what this infographic highlights and discuss how we should address it. 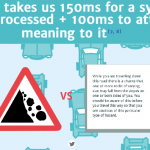 Blaming the Internet for Shorter Attention Span? It is a constant cry from teachers everywhere – my class has no attention span. Fact or Fiction, complaining doesn’t address the issue. 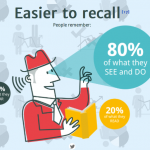 One thing that has become clear over the years is that more and more children are identifying themselves as Visual learners. There is no doubt we are living in a Visual World. When my parents were at school, TV didn’t exist, let alone the Internet and iPads. Books and newspapers were the only way to learn so children learned that way. Children were entranced by the written word and had to use their imagination to picture a character or a scene. Today, though, we live in a world where Pixar has replaced Shakespeare as the world’s great storyteller. Newspapers are replaced by TV News which is now being replaced by Online News. It’s the reality we face. It’s not going back to the old days. It’s not the internet’s fault though. Kids have become more visual so we have to present more visually. Teachers can’t expect their students to attentively listen to them talk or read to them for 20 minutes when their life experience is visual text. We do have to change our mode of teaching. We have to be more visual. BUT (and I’ll be using that world a lot in the next few paragraphs)… there does still need to be balance. Parents need to still make reading part of their kids’ lives from birth. Parents need to hold back the iPad/DS as babysitter/entertainer while their children are developing their minds. Parents and Teachers have to command attention from these children by engaging with them, expecting their attention and a quality response. Don’t blame the internet if we let them replace us with it. Bad Habits from the Internet? Left under trained, yes our so called ‘Digital Natives’ will fall victim to these bad habits. We could say that the proliferation of social media with its unlimited threads of comments, links, polls and information is breeding a generation of skim readers trained in reading 144 characters and nothing more. Keeping track of 1000 Twitter followers and Facebook friends can often lead to missing important content amidst all the mindless guff. And doing all this while listening to music and replying to text messages can tax even the best multitasking minds. What are we as adults doing to teach them a better way? Knowing this is their natural way, teachers need to teach digital literacy skills so they know how to handle this information overload. Reflection through blogging or curating through social bookmarking needs to be part of the educational environment for these kids. Expectations for and lessons in detailed reading need to be commonplace. Just like we taught students how to read encyclopedias and textbooks in the pre-digital age, we have to TEACH them how to read the Internet. It’s not the Internet’s fault. It’s just a MUCH bigger version of the old reference source. It takes a different approach. And too many of us in schools haven’t recognised that yet. Internet Blamed for Poor Research? No denying this is an issue. Copy and paste, Google as reference in bibliographies, Wikipedia plagiarism, relying on poor quality links on Page one of 200,000 are all commonplace problems in the classroom. Is it the Internet’s fault? Are kids stupid because the Internet is full of rubbish or are we stupid because we haven’t taught kids how to access the most comprehensive source of information in existence? We are not doing a good job of teaching students how to research in the digital age. It’s a big job and just setting research assignments without spending a large chunk of our literacy program teaching them how to search for credible sources on line is not helping. 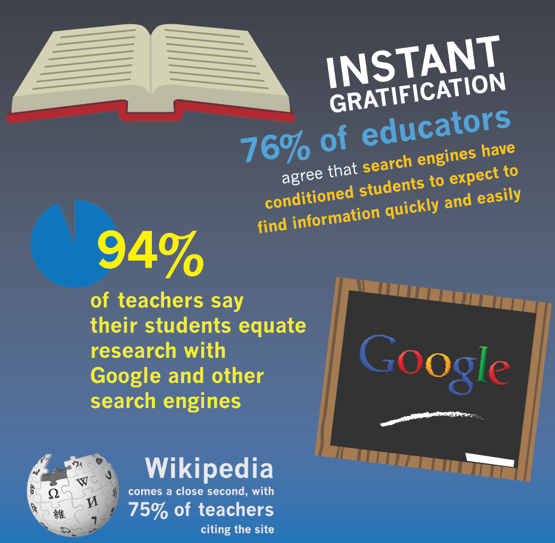 How much do we as teachers really know about how Google works? What are we modelling to our students? Are we teaching them how to use Wikipedia responsibly or just banning its use because we don’t have time to show them its benefits. When have we shown them how to research through interviews, surveys, searching for primary sources online ( they are everywhere if we can get past Answers.com! ), organising excursions/field trips, inviting/seeking out experts as guest speakers? Do we teach left/right wing bias that is found in textbooks and literature past and present or just blame the Internet for all the misrepresentations of history? We’ve got a lot of work to do as teachers to prepare our children as the Internet continues to exponentially grow in size. I’m not doubting the issues raised in this infographic are not real. And yes, the Internet is a factor. But it’s not the Internet’s fault. We, parents and teachers, are responsible for how our children develop. They are growing up in a world foreign to the one we were kids in. As adults we have to be proactive in helping them not become stupid on the Internet. I like the four points at the end. 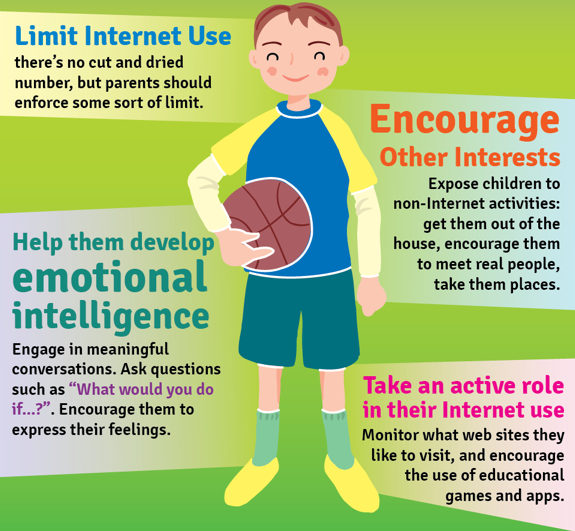 Limit Internet Use and Encourage other interests. At home and school. Children need balance and variety in their lives. This needs to start early. Much to his dismay, my son, unlike all his mates, was “denied his natural right” to a video game console until he was 11. During these years of trauma, he learned to appreciate reading, Lego, role playing, puppetry, history and geography as well as the necessary doses of football, cricket and basketball. Like his sister, whom he is very close to, he developed an ability to concentrate for long periods of time and entertain himself without technology. They still got their dose of the internet regularly, with and without Dad, but the word boredom has never been in their vocabulary. At school, we need to get the balance right too. Don’t over rely on the Internet. Entertainment value does not always equate to educational value. Sometimes some left over cookies from Camp can engage your students in learning fractions more than a whizbang ‘interactive game from the internet’ projected onto a whiteboard screen. Expose students to old school and digital age. The natural world can still be a wonderful experience. Emotional Intelligence and Active Role. The Internet and the iPad should never have replaced parents as entertainment options. Kids today who have bad attention spans are the result of lack of human interaction. If we don’t talk to our kids, they won’t know how to communicate. We should be the first port of entertainment, not technology. Same at school. This current push in some circles to replace teaching with technology is ridiculous. Humans must interact with humans to grow up as humans. Nothing more to say on that. And as for this Digital divide between the natives and the immigrants – get together, old and young. It’s a multicultural society we live in. Get on the technology with each other. Adults, learn some of those new fangled Web 2.0 tools and enjoy them with your kids instead of making excuses. Kids, let Mum and Dad in on your online experiences. Just like families used to enjoy time together before the digital age, make the effort to enjoy online time together. Adults, we have to be part of the solution. Don’t blame the internet. It’s not making kids stupid. We’re letting it. Don’t let it happen. My school has done a lot of work in developing questioning skills to support teaching and learning. The idea of “fat” and “skinny”/open and closed questions has been emphasised in student research projects and discussion building. “Enabling” and “extending” prompts is our current focus in Mathematics differentiation in particular to cater for the needs of the wide spectrum of skill levels. Targeted questioning addresses this issue in different ways. I model to my graduate teachers the art of catching students, especially the reluctant participants, understanding something during the lesson. I then ask a question directly to those students, knowing they can answer the question. This builds their self esteem because they are prepared for the answer and encourages further participation. In preparing lessons for Literacy using the “Reading to Learn” program/strategy, one of the key factors for success is creating differentiated questions that involve all students in the discussion and comprehension of the text being explored. For the less able readers, prompts are prepared to direct them to specific sections of the text while extension questions encourage the higher achievers to share their knowledge to support the comprehension of others. This kind of targeted questioning enables full class participation. The fact that students know that a question will be directed personally at them rather than the ‘get out’ clause of ‘hands up who wants to answer’ places expectations on them to follow the text and think about a response at all times. And then there is this YouTube video I’ve just come across thanks to my good buddy Zite. This takes targeted questioning to another level. Created by Jim Smith, a teacher for Derbyshire, England, it explains a process for planning a structured approach to asking your students questions. Without going into too much detail ( Jim’s gone to the effort of making the video to explain it, after all! ), it involves knowing your students’ capabilities and preparing questions geared for different levels of understanding on the topic you are teaching. Then it comes down to knowing which students to direct the questions at. It’s a form of differentiation we as a school are becoming more familiar with but the process Jim goes through is, for me anyway, quite effective and should be of great benefit in any classroom. Initially, it would take quite a bit of preparation, but if we aren’t going to use questions effectively to target student needs, preparation is necessary. This looks to be a good process to follow. Here’s the video. Feel free to share your opinion. 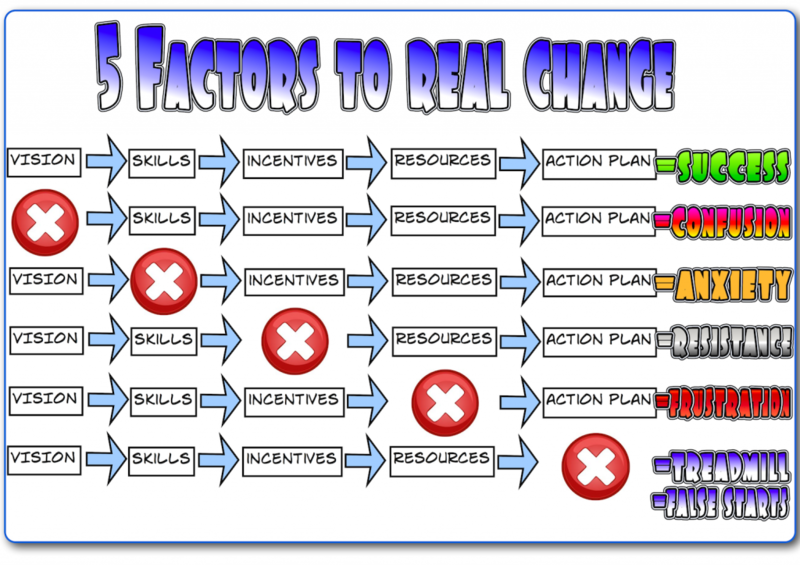 Scanning Twitter feeds today, I came across a Chart showing the 5 factors needed for Successful Change. 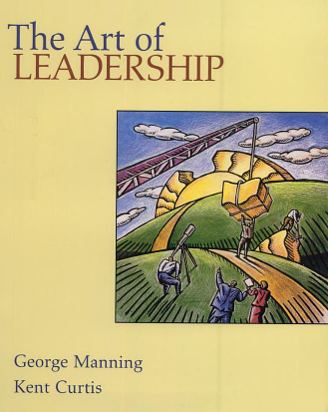 After a bit of research, I linked it back to “The Art of Leadership” by Manning and Curtis (Manning, George, and Kent Curtis. “Part 2 – The Power of Vision.” The Art of Leadership. Boston, MA: McGraw-Hill/Irwin, 2003. 56-66. Print.) Below is the relevant excerpt of the book courtesy of Google Books. While I recall seeing this years ago, it comes as a timely reminder to all involved in massive change that is expected in schools today. It is quite confronting viewing this chart and reflecting on what is needed for REAL, long lasting change to take place. Schools are always clear on the need for a Vision. Of course that vision needs to be clear, committed and shared by all stakeholders in a school, including parents and students. It’s why we have so many surveys asking for their opinions on curriculum. If we as teachers embrace a particular curriculum change but it is not supported at home, then it makes teaching and learning difficult, when children are getting mixed message from home and school. Skills need to be developed for change to take place or teachers can’t implement the changes required. Professional Development that makes a difference and available to all staff is vital. School communities need to see a final result that is going to lead to improved teaching and learning outcomes. This is how I define Incentive in the School Change setting. If we don’t access the required Resources to implement the change envisaged in the School’s Vision, it won’t occur. All the good intentions in the world are no substitute for the actual staffing, equipment and training required. Finally, a clear Action Plan is required to make it all happen. Change takes time. Time needs to be managed. Management requires planning. Looking at these 5 factors in their totality, it is not surprising that real change in Educational Technology is so difficult. Too often, we put the Resources in place without the Skills to use them. We jump on the latest tool or idea without planning how it can be implemented effectively. We put together a wish list of short term plans but lack a Vision for the final result. And so often, we fail to articulate how it is actually going to help/improve the teaching and learning in the classroom and result in better outcomes, failing to provide an incentive to change current practices. And the result? Frustrated, anxious teachers who struggle to learn the skills required and don’t see how it is going to improve their teaching and the student’s learning. At a system level, we pump money into resources for short term gain but then run out of money to maintain resources before teachers are ready to take advantage of them after decent training based on a purposeful action plan. We then hop back on the treadmill and chase the next change without actually ever reaching the goal our vision sets. IF we are ever going to really fulfil the vision of all those wonderful orators who inspire us at conferences, on blogs and online TEDTalks, we need to consider all these factors. Educational Technology has been floating around school for a over quarter of a century. Sometimes we seem no closer to the Holy Grail of learning change than when those first Apple IIs were rolled out all those years ago. 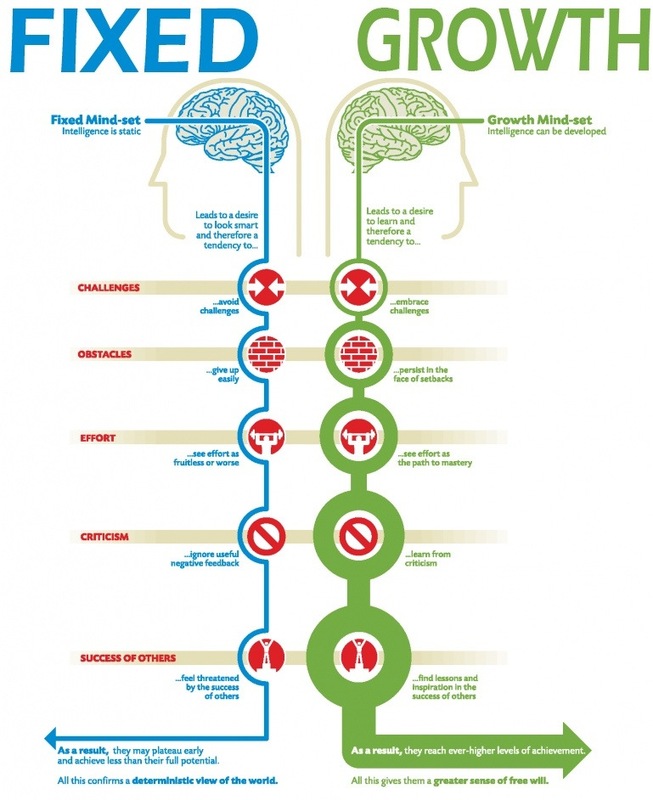 The infographic below ( click on it to get a larger, readable version from the source) stimulates good discussion about the process of brainstorming. While its reference point is the business world, brainstorming is clearly an oft-used and abused strategy in both classes and staff meetings at school. While we have developed this strategy somewhat with techniques like Think-Pair-Share, we can still fall back on the traditional model when strapped for time, with far from stellar outcomes. While this infographic focuses on brainstorming, I think its message resonates across all forms of group work that occurs in schools, involving both students and teachers. I think it deserves reflection. The following points are what I connected with as I read through the infographic. SOCIAL LOAFING – common in both student and staff settings, it is human nature to sit back and allow others to do the work if they are happy to. I see this at all forms of meetings involving school staff and it is particularly common in classrooms during whole class lessons. This is when you see the same 8 teacher pleasers and high achievers constantly contribute and give the teacher a false sense of success in getting the message of the lesson through. There needs to be protocols set in place so that all group members are accountable for contributing. SOCIAL MATCHING – Allowing group participants to choose their group members is fraught with danger. Amongst both children and adults, less dominating friends are loathe to disagree with their opinionated mates and very little innovation and debate occurs. Being in a group with leadership is also difficult if you have to go straight into groupdiscussion. Few challenge the boss without preparation. PRODUCTION BLOCKING – Dominant speakers not only take up air time but being forced to listen to them takes away opportunities for others to think about their opinions and ideas. This is one of the biggest dangers of group brainstorming – the first good idea expressed is accepted and stifles creative thinking and discussion. LACK OF ATTENTION – Large groups gives members an easy way to disengage. There is always someone contributing so the rest can switch off, allowing some to hide away during the entire discussion and avoid thinking. FEAR OF CRITICISM OR REJECTION – Anonymity is important sometimes. Processes that collect ideas without leaders/teachers knowing the source can allow reticent participants to share their opinions and ideas. 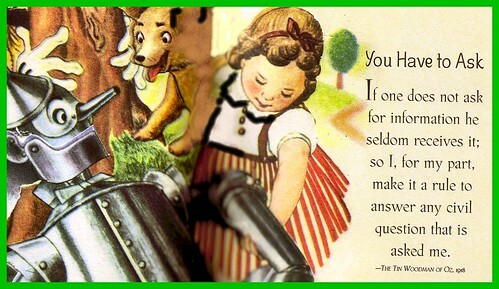 Ideas can then be challenged, not the person. And, who knows, that idea you though your teacher or leader was going to hate..may end up being the best one offered. Independently prepare – While we are getting better at this for prepared Brainstorming sessions, I still think there are too many instances when we go straight to discussion without allowing for preparation. It happens in both classrooms and staff meetings. Often the only one prepared is the organiser who then dominates discussion. Even during general class time, there needs to be time for ALL students to think about a response, Teachers should monitor potential responses and catch a typically reluctant child with a good answer to call upon. Agendas need to go beyond dot points and elicit responses from participants by providing some questions and details to consider. Set a Goal – Too often, thinking stops because we think we have finished. Clear goals or criteria (set the bar high but achieable), whether time or quantity based, laid out at the beginning focuses participants on maintaining engagement in the task. Have Meeting facilitators – Regardless of group size or duration of task, group leaders maintain focus on the task, This needs to be attended to during any group related task. Accountability creates attentiveness. carefully reflect on ideas before responding and a requirement that you have a justification or alternative to the idea raised. Negativity without a practical reason is unacceptable. Encourage competition – We avoid this too much in schools today. While we are after quality over quantity, you often get neither if there is no incentive. The aforementioned goal/criteria is the starting point. Competition is the finisher. Hear someone’s ideas. Allow for others to present something better in response. Competition encourages greater effort. Lack of it discourages trying. Try Collaboration Apps – Never one to pass on an opportunity to sell technology as a solution, I have had great success over the last couple of years using apps like Edmodo for brainstorming ideas. It addresses many of the problems mentioned above, Be forewarned though. It requires very stringent protocols to be in place lest unsavoury flame wars break out a la Apple vs PC vs Android nonsense. Monitoring and rules must always apply, even ( sometimes especially ) at the adult level. Group work/brainstorming is a staple of the Education system. Sometimes, though, we take the process for granted, and get less than satisfactory outcomes as a result. We must always plan for these opportunities and I think this infographic is a useful resource to have beside you every time you are considering a brainstorm session. How do you prepare for group work or brainstorming? Join the conversation. I had a great experience today with a student who has recently arrived in our country. The time I spent with her made me consider how assessments and test scores can overly influence our opinions of students, Especially if we don’t take the time to get to know the child behind the score. assessments to identify the needs of individual students. They serve a purpose in preparing personalised learning programs for children who need both intervention and extension. But raw numbers don’t tell us the full picture. Gloria is a classic example. She scored low in the standard spelling test administered by her classroom teacher. So did many others. Because of the results, targeted spelling programs were developed to support these students beyond the main class spelling program. Gloria was included in these programs with support from teacher aides. Let me make it clear right here. Teacher aides are fantastic support in classroom. For children with learning difficulties, teacher aides are vital for them to survive the classroom struggle on a daily basis. But sometimes kids with low test scores don’t need teacher aides – they need teaching. Gloria didn’t score low on the spelling test because of a learning difficulty. She didn’t score low because of a physical disorder or because she has emotional issues that have affected her concentration over the years. Gloria scored low because she speaks Spanish! She doesn’t need a teacher aide to sit with her and work through a worksheet of spelling words. She needs a teacher who has sat down with her, listened to her read words, watched her write words and recognized that her errors were based on the different sounds found in the Spanish language. I had my first extended experience with Gloria by chance this week. The teacher aide who has been working with her was away and her teacher asked me to step in and take the group, as I was between jobs that morning. As soon as I was handed the spelling worksheet assigned for the week, which was addressing the ‘j’ sound (spelt g-,j-,-dge, -ge), my years of background knowledge in languages through applied linguistics training and Latin rang alarm bells in my head. This was going to be a big challenge for Gloria for one simple reason – j is not j in Spanish and the -dge grapheme doesn’t even exist. This needed to be addressed with Gloria, not because she was a bad speller, but because she had no experience with this spelling system. While working with Gloria ( and the other two students who were more interested in what was happening at the other end of the building, hence their need for a teacher aide to keep them on task), I discovered a girl with a rich knowledge of her mother tongue’s spelling system. While still interacting with the other students equitably, I was drawn into deep conversations about the similarities of g in Spanish and English, depending on the vowel that followed. We had great dialogues about the different use of e and the end of Spanish words. We notice similarities in letter combinations between the equivalent words in each language like jirafa and giraffe. While reading words in the spelling list on the worksheet, I picked up other issues that were not spelling related but Spanish phonics related. It makes sense that Gloria can’t spell luggage because a Spanish speaker would pronounce it ‘loogage’. U makes one sound in Spanish, in English it makes 2, one of which doesn’t exist in Spanish. Gloria knows a great deal about spelling conventions, but in Spanish. She doesn’t need a remedial spelling program; she needs an English enrichment program. She understood what we discussed during this lesson we had. The other two just chose some words to learn during the week that they will probably get correct in a test next week but not relate to other experiences of the ‘j’ sound in their writing. Students like Gloria need more than a test score to work them out – they need teachers to get to know them. I’ve had the same experiences during the Mathematics interviews I’ve been conducting this term. The interviewees were selected based on low test scores. During the interviews, though, I found students with sophisticated mental computation strategies that, based on reading test scores, were having literacy issues not numeracy issues. For others, we discovered why they survived to a certain grade level at an acceptable standard then suddenly dropped alarmingly – they were completely reliant on counting by ones for everything. 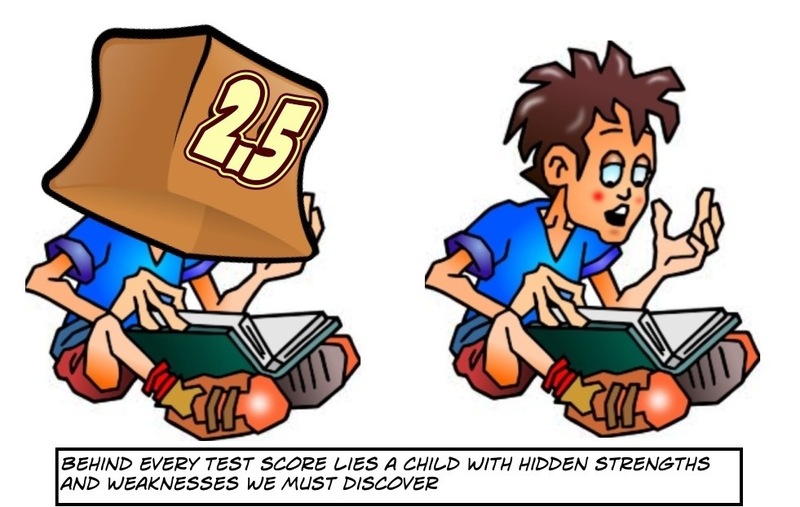 Standardised testing and the resultant scores are good indicators for potential learning difficulties or strengths. But they’re no substitute for face to face interactions. And sometimes that one on one interaction needs an experienced hand to really pinpoint the need. I’m committed to working with Gloria as much as I can this year. If our chance meeting didn’t occur, she could have spent the year only working with a teacher aide group with students with learning difficulties. We can’t let the push for standardised testing, even at the diagnostic rather than school comparison level, blind us from the fact we need to get to know our students more intimately. We owe it to the Glorias in our classrooms.